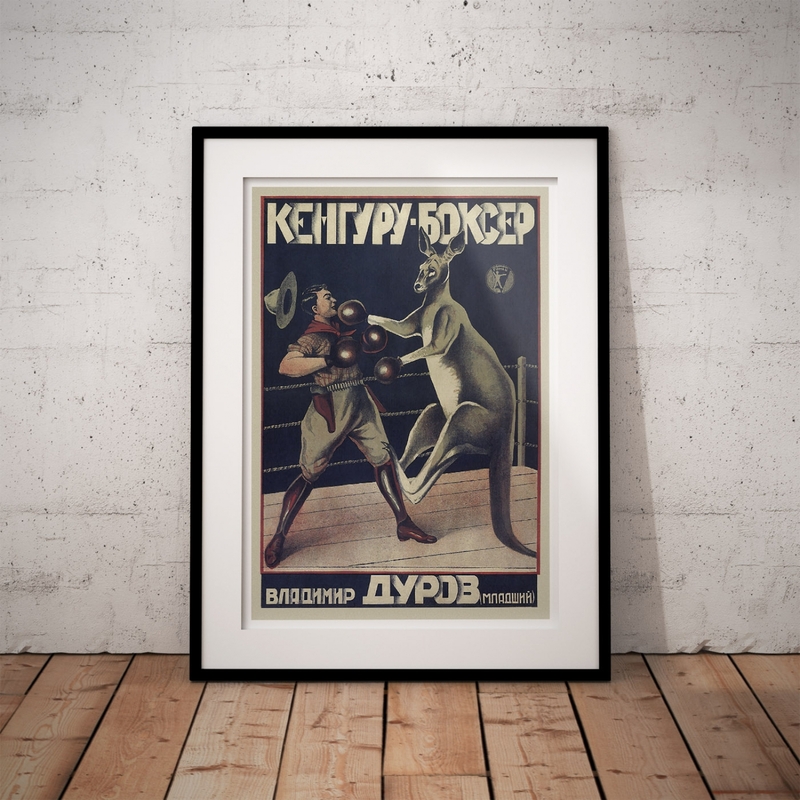 The original poster dates from around 1933 and has been made famous as “Joey and Chandler poster” in the American sitcom, Friends. 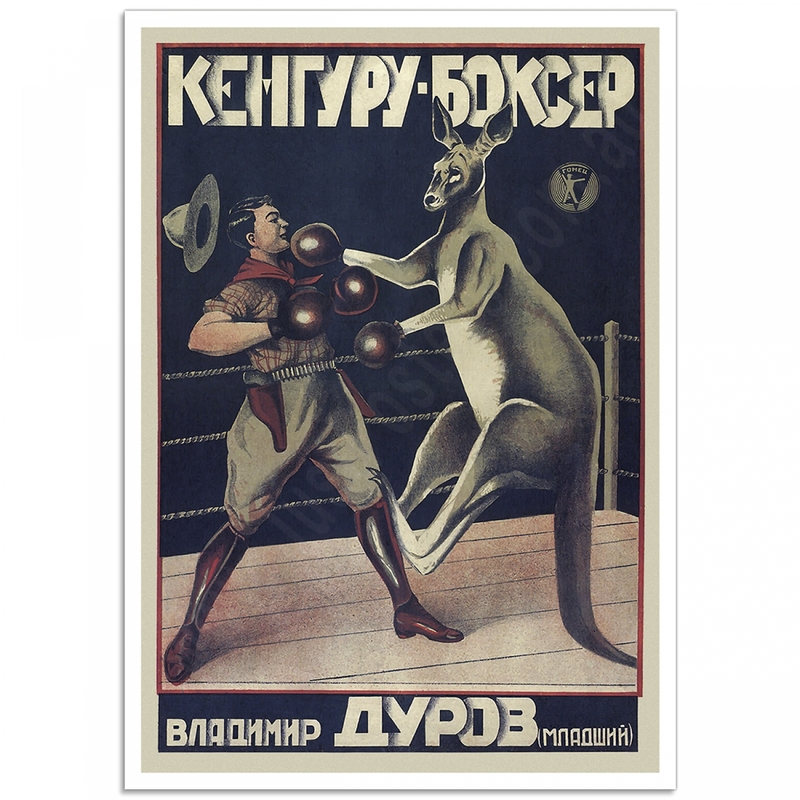 The Heading at the top of the Poster translates from Russian to “Kangaroo Boxer” and at the bottom is the name Vladimir Durov, "Jr". The logo next to kangaroo’s shoulder is the GOMETs logo, the State Association of Musical, Variety Theatre, and Circus Enterprises. GOMET was a division of the Ministry of Enlightenment, which was in charge of the administration and regulation of arts and entertainment during the Stalinist period. GOMETs also administered the Central Administration of State Circuses (TsUGTs) during Stalin’s rule. Vladimir Durov, Sr. (1863-1934) was a member of the famous Durov family and was considered Russia’s leading Circus Family. 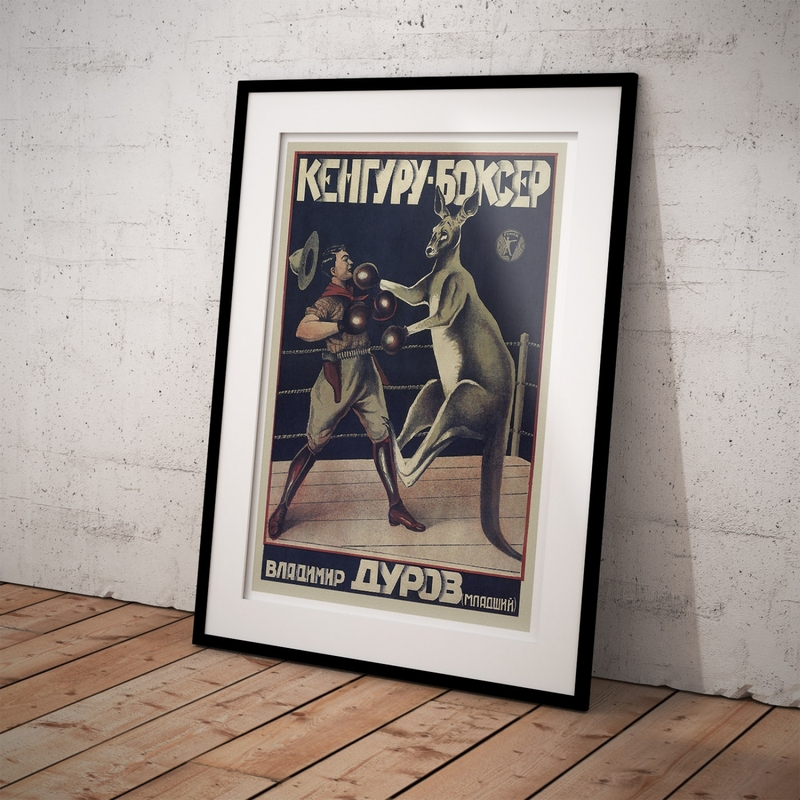 The Durovs became a huge sensation during the Tsarist autocracy and the family’s reputation as the nation’s most legendary and pioneering “circus family” is still celebrated today. 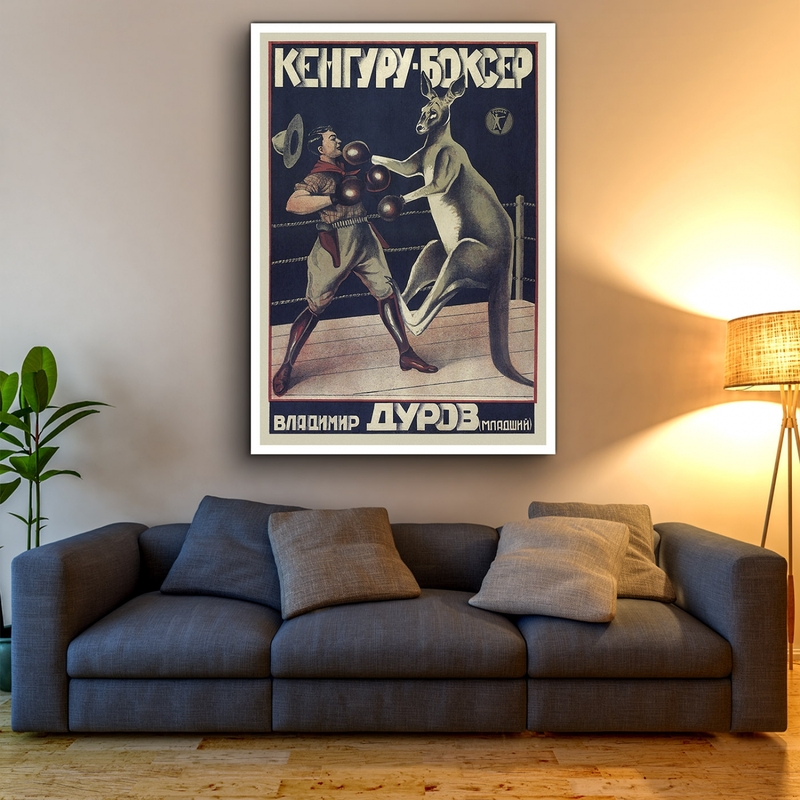 Vladimir was a very famous clown and animal trainer who passionately supported the Bolshevik Revolution. Many of his performances mocked Tsar Nicholas II and his government and praised the Bolsheviks. Both Vladimir and his brother Anatoly referred to themselves as the “kings of jesters, not the jesters of kings”. 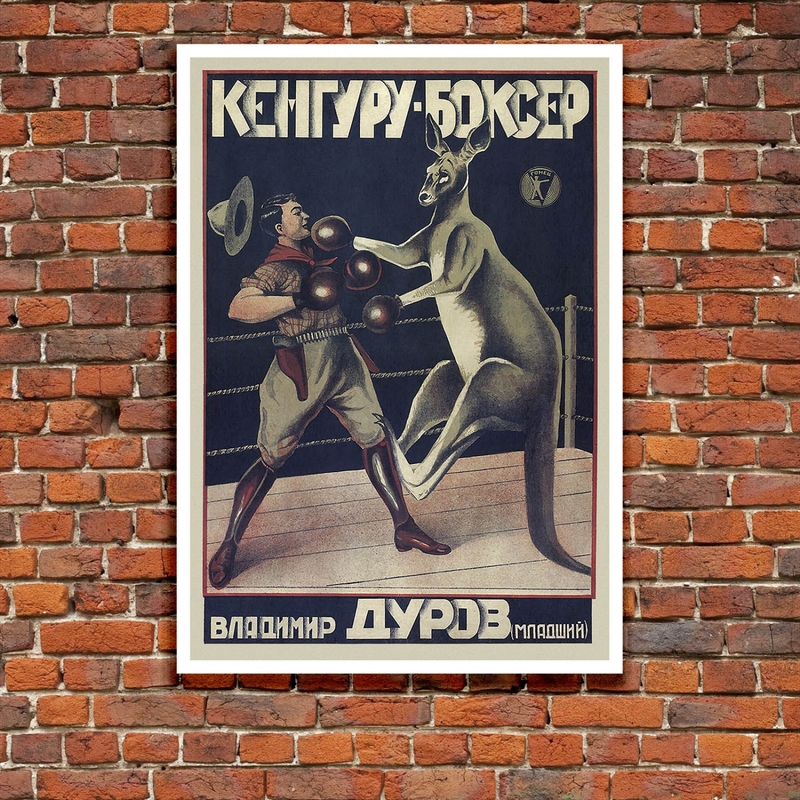 The 'Kangaroo Boxer - Vladimir Durov' Poster is a reproduction of a Vintage Circus Poster. Available print sizes: A4 [210 × 297mm], A3 [297 × 420mm], A2 [420 × 594mm], A1 [594 × 841mm] and A0 [841 × 1189mm]. Wonderful Elephant Brass Band- Vintage Circus PosterThe Elephant Brass Band, nothing like it h..
Madam Ada Castello and Jupiter - Vintage Circus PosterRingling Brothers - World's Greatest Shows The..
Miss Louise Hilton - Gentry Brothers - Vintage Circus PosterGentry Brothers Circus, Louise Hilton, ".. The Marvellous Football Dogs - Vintage Circus PosterThe Barnum & Bailey Greatest Show On EarthTh..